8 x 10 glass plate negative photographed by Charles Edwin Bolles in 1895. View of the crew aboard the 123' Herreshoff sloop DEFENDER (built 1895 in Bristol, RI), seen hoisting the mainsail. 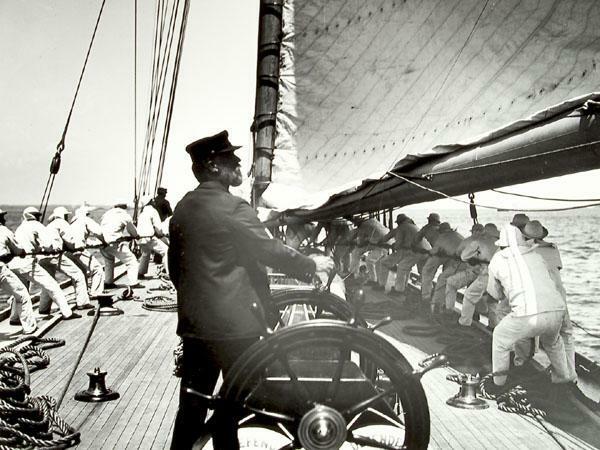 Visible in image: deck view of Captain Hank Haff standing at the wheel looking off to starboard as two lines of crew haul on mainsail halyards. Handwritten on original negative sleeve: "Y-834 / Box 84 / Crew of Defender / HANK HAFF / BOLLES/ 1899". For more information see: A CENTURY UNDER SAIL, text by Stanley Z. Rosenfeld, page 24. CREDIT LINE: Mystic Seaport, Rosenfeld Collection, Charles Edwin Bolles.